Think of football in Madrid and the mind turns instantly to Real and Atletico, two of Europe's superpowers whose successes have given the Spanish city a major claim to being the football capital of the world. With six Champions League final appearances between them in the past five seasons and a combined 43 La Liga titles in total, attention in Madrid inevitably focuses on the Bernabeu or the Wanda Metropolitano. But you might not be aware that the city also possesses three more top-flight clubs, whose individual quirks capture the essence of Madrid's footballing scene perhaps even more than the big two. Far away from the tourists and day-trippers, Getafe, Leganes and Rayo Vallecano are clubs with proud and distinct histories, and their own stories to tell. This weekend all three were in action in Madrid, with Getafe hosting Rayo in a derby on Saturday before Leganes welcomed Valencia on Sunday. BBC Sport headed to the Spanish capital to find out more about football in Madrid, but not as you probably know it. From Madrid's main central railway station, Atocha, it's just a 15-minute journey to Getafe, an unremarkable suburb on the city's southern edge. Perhaps because of that anonymous location and a fractured history which saw the club disbanded and reformed as recently as 1983, Getafe have struggled more than any other Madrid team to establish a strong sense of identity. The widespread perception of Getafe's forgettable blandness was rudely summed up by Valencia newspaper Las Provincias after a fiery recent cup tie between the teams, with an article sarcastically stating: "Where is Getafe? Have you ever been to Getafe? Or met anyone from Getafe? Does it even exist?" That kind of casual disdain has understandably led to the club developing something of a persecution complex, expressed by veteran captain Jorge Molina in the aftermath of the cup exit against Valencia, when Getafe felt they were victims of unjust officiating. "There aren't many of us from Getafe and it looks like we bother people. We're the bad guys, as always," complained Molina, whose words were quickly leapt upon by his team's fans as they launched a 'Respect' campaign calling for more recognition from the wider world. Getafe might not be the most progressive club - they only launched an official Twitter account in 2015 and their official store is a tiny corner shop below an apartment block - but their reputation is rather unfair. The club's Coliseum Alfonso Perez stadium, nestled between apartment blocks and a motorway, is a tidy, well-kept and compact venue, and the club's president Angel Torres - a hard-nosed local businessman - deserves credit for keeping the team in the top flight for 14 of the past 15 seasons despite operating on a small budget. The rest of Spain might not like it much - or even have particularly noticed - but Getafe are long-established members of the top flight, and they deserve to be taken a bit more seriously. Saturday's visitors to the Coliseum, Rayo Vallecano, have never encountered such problems in finding their place in the world. From their distinctive playing kit (all white with a diagonal red stripe, like Peru), their quirky home ground (only three sides have been built) and their famously loud and loyal fans, Rayo have long been regarded as one of Spain's most distinctive teams. Specifically, the club is inextricably intertwined with their neighbourhood of Vallecas, a low-wage, densely populated and multicultural district just to the south-east of Madrid city centre. Rayo's down-to-earth image is summed up by the title of a book about the club, Working Class Heroes, written by Madrid-based journalist Robbie Dunne, who told BBC Sport: "They are a throwback to a time when football was for and by the fans. There's an authenticity that is hard to find and while it tends to be a little rough around the edges, Rayo fans wouldn't have it any other way. "They're a fan-driven club and that's very important to their identity. It's more than just about football. It's about belonging." Those sentiments were echoed by Rayo fan Alfredo Marcos, who made the short journey to Getafe to support his team on Saturday. "It's a special and unique club," he said. "Rayo instil values that go beyond football, like humility, hard work and equality. The club doesn't belong to Madrid but to Vallecas, which is one of the biggest 'barrios' in Europe with nearly half a million inhabitants. It's a very traditional district and Rayo represent us on the pitch." 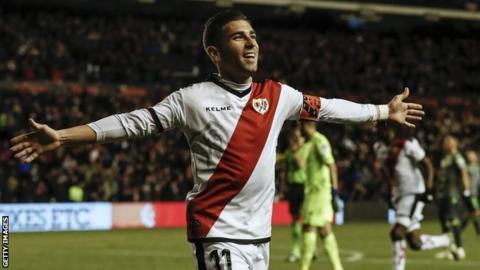 Rayo have no pretensions of grandeur, never really attempting to become bigger than they are. And although that might limit their potential for trophies (they have never won anything major), there's no way they are changing - the fans wouldn't allow it. While Rayo are Madrid's team for the workers of Vallecas, Leganes have been working hard to establish themselves as the capital's most family-friendly club. Leganes - located next to Getafe south of the city centre - was formerly an agricultural district and that history has bequeathed the club with an unusual nickname: the Cucumber Growers (Los Pepineros). And since gaining promotion to the top flight for the first time in 2016, Leganes have won the affection of neutrals by exploiting the comedic potential of their nickname to the full. During their first season in La Liga they presented every visiting team with a basket of cucumbers, and they inaugurated a new trophy, 'The Golden Cucumber', with a pre-season friendly against Rayo. A sign outside their small but smart Butarque home encourages fans to enjoy that 'cucumber-growing feeling', and the pre-match atmosphere is whipped up by everyone's favourite mascot: Super Cucumber. The club's approachable and good humoured attitude has allowed them to attract an unusually large number of young fans, and the Butarque was packed with families for Sunday's meeting with Valencia. One dad-and-lad pairing was Juan Pedro Fernandez and his four-year-old son Ruben, who explained that although some of his school friends support Real or Atletico: "I prefer Lega. We are nicer than them." Ruben's father, like other Leganes fans, has been astounded by their recent rise into the top flight, having grown up watching them in the fourth tier in front of a few hundred fans at most. And although he is fully enjoying the opportunity to go head to head with the big guns, he is realistic about the future. "The club has limits," he said. "It's impossible for us to compete with Real Madrid or Atleti, they're in a different world. The most we can do is try to stay in the top division." Getafe into the Champions League? On the pitch, Getafe have shrugged off their nondescript image to enjoy a remarkable season, climbing into fourth place with Saturday's deserved 2-1 win over Rayo. Much of the credit belongs to slick coach Jose Bordalas, who has cultivated a team based on strong defence - marshalled by outstanding Togo international Djene Dakonam - but also capable of playing fluent and confident attacking football. Strike pairing Jaime Mata and Molina both scored on Saturday to take their league tallies for the season to 10 goals apiece, leading fans to chant for 36-year-old Molina - a former long-time servant of Real Betis - to be called into the Spanish national team. The defeat at Getafe was Rayo's fourth in a row and left them inside the relegation zone, and during the coming weeks they will depend heavily on the goals of ex-Real Madrid trainee striker Raul de Tomas, who seems certain to have a future in the top flight even if his club doesn't. Prospects are much brighter for Leganes, whose 1-1 draw against Valencia on Sunday left them seven points clear of the drop zone and means they have still only lost once at home all season - they claimed a famous scalp in September by beating Barcelona 2-1. Leganes, managed by former Southampton and Alaves boss Mauricio Pellegrino, are not a team to everyone's taste: they are rugged, physical and play an unusually high number of long balls, leading Betis boss Quique Setien - a proponent of passing football - to complain "they don't worry about playing well" after his team's recent defeat at Butarque. Considering where they have come from, however, the club's cucumber sandwich brigade of fans couldn't care less - all they want is to keep Madrid's collection of top-flight teams intact for another season.